Eurocom Corporation, a leader in the Desktop Replacement notebook technology since 1989 has launched a more powerful than ever before Mobile Workstation. Eurocom has taken the next step in the evolution of the desktop replacement by combining workstation like features, power and flexibility with Eurocom desktop replacement technology and AMD Dual Core and FX Single Core Processing Power. Dual Core Processing Represents the next step in computing evolution and Eurocom already has announced a mobile system supporting the technology before many desktop manufacturers have reached this goal. AMD Dual Core Technology Advantage As stated by AMD, “In today's digital world the demands of complex 3D simulations, streaming media files, added levels of security, more sophisticated user interfaces, larger databases, and more on-line users are beginning to exceed single-core processor capabilities. Introducing the D900K F-Bomb, the world’s first notebook with a Dual Core AMD Athlon 64 X2 processor for blistering application performance. From artwork design to video editing and gaming, the dual core processor will make sure that your system stays responsive when taking care of the most complex multiple tasks. The Xtreme 64 delivers true multi-tasking, allowing you to switch from one program to another without waiting for the computer to catch up. The D900K F-Bomb features fully upgradeable video technology with 256MB GDDR3 and 16-pixel pipelines to ensure that even the latest applications and games look their best wherever you are. It supports the most powerful mobile graphics accelerators available from ATi and nVidia including ATI's Mobility Radeon X800 XT Platinum Edition, nVidia 6800 Ultra or nVidia's Quadro FX1400. 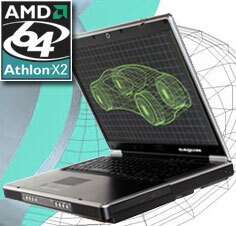 Take the optional AMD Athlon 64 FX-57 to boost your fps even further. Our unique UltraBright Glossy screen technology comes as standard giving a wider viewing angle and improved colour brilliance. Choose your D900K F-Bomb with Windows XP Professional x64 Edition for a fully 64-bit capable notebook and take advantage of new 64-bit applications and games which will harness this increased power now! - AMD 64-bit Dual Core and FX processors for greater stability and higher performance for today's demanding users, wireless mobility, and long battery life and built-in support for next generation AMD64 software. - Portable storage: Standard internal 10-in-1 card reader supports all major memory cards such as: Secure Digital/MultiMediaCard, Memory Stick, SmartMedia, CompactFlash. - Choice of drives such as: DVD-ROM, COMBO drives (DVD-ROM and CD-RW), dual 2x, 4x DVD Burners (DVD+-R/+-RW) and 4x Slot Super DVD Multi Drives (DVD-RAM/+RW/-RW; CD-RW; DVD/CD-ROM). - 1x Kensington port for Security Cable and Lock.